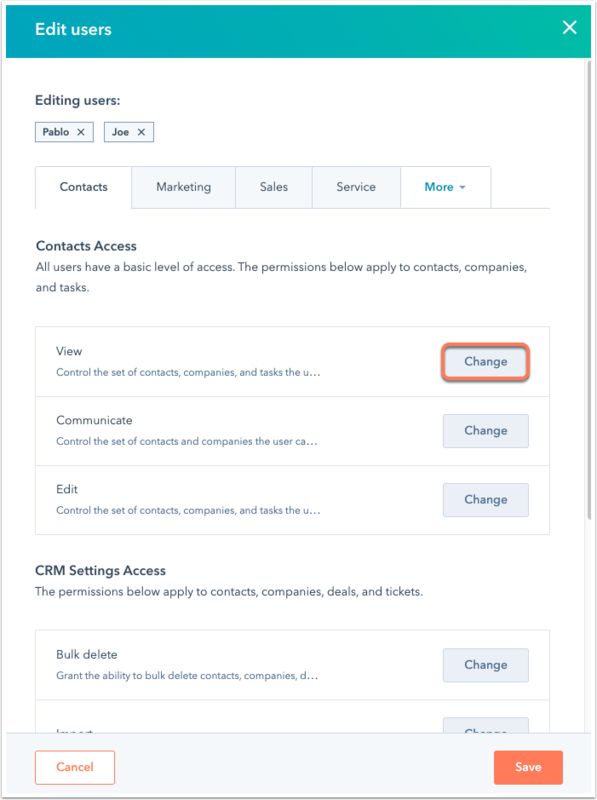 Super Admins and Admins with access to adding and editing users in your HubSpot account can change the permissions for existing users in your account. In the right pane, navigate the tabs to grant and restrict permissions. To make the user a Super Admin, click the Actions dropdown menu and select Make Super Admin. This will automatically give access to the user all tools and settings, with the exception of Sales Hub Starter and Professional features. Please note: you must be a Super Admin to give other users Super Admin access. At the bottom of the pane, click Save. Select the checkbox next to the user(s) whose permissions you want to edit. At the top of the table, click edit Edit. In the right panel, navigate the tabs to grant and restrict permissions. Click Change next to specific permission(s) to adjust the users' access. Giving a user no access will effectively delete the user. All users must have access to at least one product to exist as a user. Learn how to add new users to your account.